0:36:30: We see Max & Vincent putting gas in the taxi at a gas station in Koreatown. Vincent warns Max about getting people killed, by attracting attention. Then, suddenly cordial, he invites Max out to a jazz club. This was shot at the ARCO station at 4169 Venice Boulevard, in Los Angeles. That's at the NE corner of Crenshaw & Venice Blvds. (although it's fairly close, about a mile to the southwest, in the midtown area). So, I have to assume that the producer added the Korean signs to the mini-mart. Here is a Google StreetView of the station. described as being "in Leimert Park, off Crenshaw". at 4333 Leimert Blvd. (between 43rd Street and 43rd Place), in Leimert Park. But Cheerio's wasn't the exterior of Daniel's. It was just next door and wound up in the scene. a small corner shop just to the north of Cheerio's, at 4331 Leimert Blvd. But it is glimpsed for just three seconds, so if you blink, you might miss it. and topped it with the neon name "Daniel's", and added the red awning. Here is a Google StreetView of the fake club's location. was the inspiration for them filming on this block in the first place. So much for the exterior. But the interiors of Daniel's Jazz Club? at 943 Sun Mun Way, in L.A.'s Chinatown. Here is a Google StreetView of Grand Star. 0:52:56: Vincent forces Max to take him along on a visit to see Max's mother in the hospital. Long Beach Veterans Hospital, at 5901 East 7th Street, in Long Beach, CA. on the left side), as well as a lower building in front of it (seen on the right side). a pedestrian bridge, that appears to be right next to the hospital. It isn't. They faked us out again. it spans the San Bernardino (10) Freeway in the City Terrace area (90063) of East L.A. So, what is actually right next to the bridge (where they inserted the hospital shot) ? Harrison Street Elementary School, at 3529 City Terrace Drive. 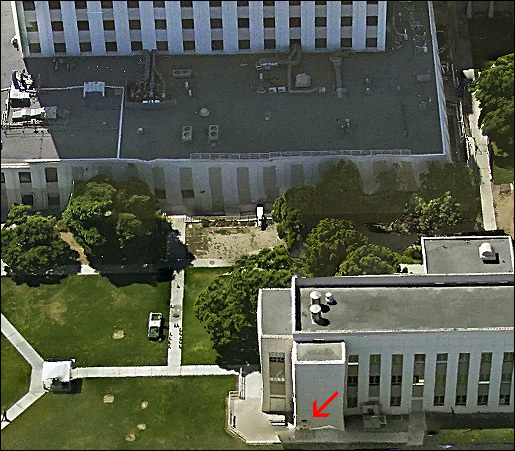 The southeast entrance to the bridge (where Max enters) is around 3481 Marengo Street. And at the opposite (northwest) end, it winds up at 3546 Whiteside Street. hit-list was in that briefcase... and he needs it back. Here is a Google StreetView of the bridge. 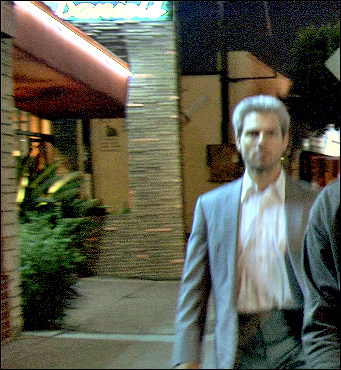 The photos on this page are stills from the Blu-Ray of "Collateral"